The Doctor will explain your x-rays, and answer all questions. Upon arrival you will be greeted by our friendly front desk CA. You will be given paperwork to fill out and we will take copies of your license and insurance cards. Then you will be taken to the exam room and receive a consultation with complete history and orthopedic and neurological testing. Next, your chiropractor will take X-rays of the involved area. You will then be put on electric stem with hot or cold packs to help you relax before your adjustment. 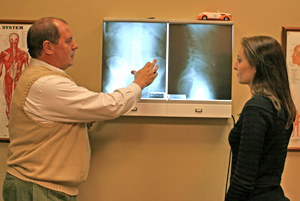 Once the doctor has had a chance to go over your testing and X-rays you will then go into an adjusting room to go over the doctors Report of Findings and the x-rays–then you will receive your first adjustment. Trigger point, stretching or rehab exercises will be discussed and administered, if needed, and at home instructions will be given. From here, off to the front to be checked out and rescheduled by our front desk CA. You should allow 45 minutes to an hour for your first appointment. Upon arrival at our office, you will check in at the front desk. If therapy has been prescribed you will be taken to the tranquil therapy room for 15 minutes. Then you will move to an adjusting room for a follow up evaluation to see how well you’ve done after your first adjustment and what is required so the Doctor can prescribe an appropriate care plan. An adjustment will be given at this time. Then, your off to the front desk to schedule your next appointment. You should allow 20 to 30 minutes for this appointment. After checking in at the front desk you are taken to therapy, if needed. 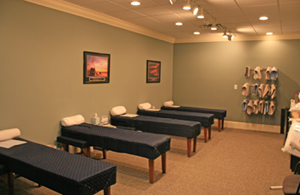 After therapy you head over to an adjusting room for a brief evaluation and your adjustment. Then, its off to the front desk to check out and reschedule.